Summary: Two guys, two girls, two thousand dollars, and one epic water gun battle. Peyton's deepest desire is to score entry to MIT. She's working her tail off to achieve her goal, but when she's dragged into Connor and Josh's water gun tournament, their antics threaten to leave her high and dry. As Peyton's forced to choose between chemistry class and chemistry with Connor, will the super student and the super athlete discover they have more in common than they imagined? One thing's for certain: When Connor, Peyton, Josh, and Molly load their weapons, someone's bound to get shot through the heart. My Thoughts: I was really looking forward to this novel when it was under a different name and a different release date. Finally, I found out that it came out in paperback and they changed the name and the summary. So I went right out and bought it and dived right in. We are introduced to Connor and his best friend Josh. Josh has a sister named Peyton. She is a year younger and Connor has always known her. Josh and Connor are participating in Senior Assassin and the prize money is 2,000 dollars. Split between the two of them, Connor is really looking forward to that 1,000 dollars. Of course, another girl is interested in Connor and he doesn’t want to hurt her feelings so Josh suggests he use Peyton as an excuse but Connor doesn’t want to do that. Yes, he is kind of a jock but he’s actually really smart too. He’s got it all, good looks, funny personality, and a brain. Connor starts to actually like Peyton and that is where the fun begins. Josh putting that idea in his head, he starts to look at Peyton in a new different light. As Senior Assassin is taking place, Connor finds himself wondering more and more about Peyton and if he could really be with her. I’ll stop there. 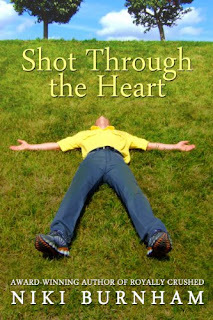 Shot Through The Heart was a good light funny romantic novel. There wasn’t a whole lot of depth to it. Yes, we find out how smart some of the characters really are, but there isn’t a whole lot of reasoning behind some of their actions. This novel is met to just be pure fun with a few lessons thrown in. I thought I would love it a little more, I thought it would be a 5 cupcake novel, but it fell a little short for me. It was still a good novel, just not as great as I had hyped up in my mind. Overall: Is it worth a read? Yes. And, if you like the Simon Pulse romantic comedies, you’ll probably enjoy this one. If you like fun reads, you’ll probably like this one. I’m probably a little biased here, because back when it went on sale at Barnes And Noble, I saw a different summary for it so I was thinking the story was going to be a little different and go a different way. Did I still enjoy it? Yes! Cover: Honestly, I don’t really like it. He’s clothes don’t really suggest teenager, they aren’t really stylish. While the premise sounds cute if fluffy, I kinda can't see a school or other organization getting behind a competition that encourages teens shooting each other, even if just with water guns. Especially if Senior Assassin is hosted by the high school--this idea just hits a little close to Columbine and other school shootings for me to really be able to look past that.